A corrosive substance is one that will destroy or irreversibly damage another surface or substance with which it comes into contact. The main hazards to people include damage to the eyes, the skin, and the tissue under the skin; inhalation or ingestion of a corrosive substance can damage the respiratory and gastrointestinal tracts. Exposure results in chemical burn. The word 'corrosion' is derived from the Latin verb corrodere which means 'to gnaw' indicating how these substances seem to 'gnaw' their way through the flesh. Sometimes the word 'caustic' is used as a synonym but, by convention, 'caustic' generally refers only to strong bases, particularly alkalis, and not to acids, oxidizers, or other non-alkaline corrosives. The term 'acid' is often used imprecisely for all corrosives. 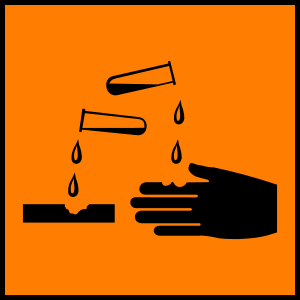 A low concentration of a corrosive substance is usually an irritant. Corrosion of non-living surfaces such as metals is a distinct process. For example, a water/air electrochemical cell corrodes iron to rust. 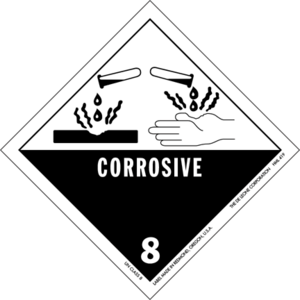 In the Globally Harmonized System, both rapid corrosion of metals and chemical corrosion of skin qualify for the "corrosive" symbol. Corrosives are different from poisons in that corrosives are immediately dangerous to the tissues they contact, whereas poisons may have systemic toxic effects that require time to become evident. Corrosive substance Facts for Kids. Kiddle Encyclopedia.